I scream, you scream… who doesn’t scream for My/Mo Mochi Ice Cream? The best part about everyone’s favorite dessert is that it’s so versatile and can be snacked on in countless ways. For those snackthusiasts who haven’t tried My/Mo Mochi Ice Cream — you are missing out on a textural adventure! This frozen dessert is made with creamy, dreamy premium ice cream and wrapped in a sweet, pillowy rice dough. No spoons, cups or cones required – just your fabulous self to carry these mochi balls on-the-go. Here are some of the best ways to eat My/Mo Mochi Ice Cream… because it’s okay to play with it. What’s sweet about mochi is that it adds texture (because chewing your ice cream is fun!) Scoop some sorbet or gelato in a cup, then garnish with two or three My/Mo Mochi Ice Cream balls on top. It’ll truly be the mochi on top of your sundae. What’s better together than cookies + ice cream? Pillowy mochi dough + cookies + ice cream. Think about cookie recipes that will pair well with the available flavors. For example, snickerdoodle cookies pair perfectly with My/Mo Vanilla Bean Mochi Ice Cream. Or enjoy the chocolately chocolate combo of a chocolate cookie and My/Mo Mint Chocolate Chip Mochi Ice Cream. Pinch it. Poke it. Squeeze it. Stack ‘em. The beauty of My/Mo Mochi Ice Cream is that it’s best when eaten by itself! 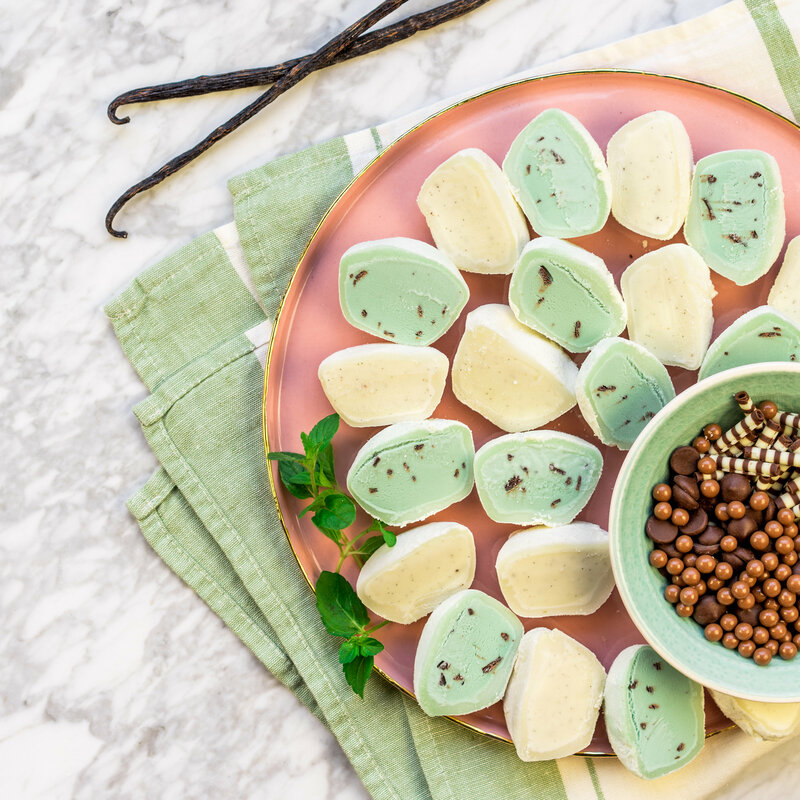 No matter how you choose to #PlayWithIt – My/Mo Mochi Ice Cream is the best snack to enjoy at any time of the day. You can get your hands on My/Mo in the frozen food aisle of a grocery store. Not sure where to find it? Use the store locator here and it will show you where you can scratch your snack itch.